Happy new year, auto tune the Chroma for some nice fireworks imitation and enjoy 2005! Very registered! I buy it because I have a big problem with an old card, and I will use it for spare parts! For what it's worth, this actually looks like a different card/auction to me; item 3769619247 had a different seller and wasn't sold; though the auction ended on December 23, it still has a "Buy It now" price of 99 Euros. Good one then, that it went to someone on the list. If my "err1" had kept appearing I would've snatched it, but since that one occasion I haven't seen the error message. Did not get any trafiic from my first try [December 2004] during the holidays. Anyone else ?? CV Pedal: I can't help here, I'd like one myself, and I don't know which type to get either! Refinishing the wood: I had totally disassembled the Chroma first as part of the restoration I did on it. I separated all the wooden pieces and stripped them down to bare wood using NitroMors and glasspaper. I filled any imperfections or knocks with "plastic wood" which I colour-matched to the bare wood using a mixture of different Cuprinol woodstains that I made up by trial and error, to give the exact shade of the wood. Then I varnished my wood, using layers of Cuprinol Cherry Gloss and Cuprinol High Gloss varnishes, I think I used about 8 or 9 layers, sanding each one down before the next layer, to get a really nice, deep shine. The mix of cherry and high gloss prevented the colour from darkening with too many cherry pigment layers. I finished it by rubbing the varnished wood gently for hours, using the finest grade of glasspaper I could get, then I cleaned it and buffed it for ages with a soft cotton cloth and Auyoglym car paint restorer, (yes, an automotive product!) It's like a very gentle cutting polish, similar to T-Cut. The end result is a lovely, deep shine of just the shade I wanted. I wanted to use the original wood, but some people have made all-new wooden pieces and varnished or oiled them as they preferred. My way worked well for me! Key Follow: I'm not sure I know what you mean - do you want to get the filter frequencies to track the keyboard? If so, use the keyboard glide as a cutoff modulation source, with a mod depth of 32 and the cutoff frequency will track the keyboard exactly. For example, set Parameter 40 (Mod 1 Select) to 0 (Keyboard Glide A, and set parameter 41 (Mod 1 depth) to 32. Remember that the Chroma has TWO filters, A and B, and the Patch (Parameter 1) influences how they are configured, as do the LP/HP selections (Parameter 37), also that the filters each have a possible simultaneous use of 3 mod sources and depths. So be aware that the results depend on how you set these also. If you mean something else by Key Follow, please let me know. Assembling Sounds: Back in the 80s, I used to load patches into the Chroma one at a time from tape dumps, save those I liked into memory and build up a set I liked. Plus a lot of programming or tweaking sounds to suit what I wanted and saving the whole lot as a "Save All" to a fresh cassette. Now, I use the excellent Emagic SoundDiver synth editor/librarian program. It is a PC or Mac program that communicates with the Chroma (or almost any other synth or MIDI device) by MIDI - use Ken Ypparrilla's MIDIconverter for this. SoundDiver has a graphic editor for the Chroma that makes programming easier, and it has extensive sound librarian capabilities that let you compile banks of sounds and save/load them individually or en masse into your Chroma. I wouldn't be without it! Sadly, Emagic, who are now owned by Apple, are no longer selling SoundDiver, although they do provide superb user support and updates via the web for the large community of SoundDiver users. If you can get a copy of SoundDiver, you won't look back. Try Ebay??? There is a public beta of SoundDiver available for Emagic/Apple customers with an XSKey. Though I'm not a SoundDiver user, I've tried it and it seems to work fine. It will be interesting to see whether Apple will release this as a product. For loading sysex banks into the Chroma I suppose I could save/load in one sound at time and build custom banks as well with it. I admittedly don't know what is readily available pedal-wise - but I'm not sure if an exact off-the-shelf replacement for the volume pdeal for the chroma would be easy to find. The Chroma's CV pedal has a mono 1/4" jack on the end. It appears that the contacts of the jack go to the potentiometer in the pedal with the the potentiometer (variable resistor) in the pedal being used to form part of an analog circuit from the Chroma. The nominal value for the full-scale resistor value seems to be 100k Ohm. So - if you can find a "variable resistance pedal" with a 100k value, I'd expect that to do the trick ... but I'm not sure how many 'standard' pedals would fit into this category. It would not be too difficult to replace the potmeter in the pedal in case it's not 100k. You might also have to change the wiring to the jack connector. I think most pedals like the EX-5 Roland and Yamaha FC-7 are 100k if i am not mistaken Anyone using these on there Chroma ?? I'm 2 1/2 years into my training as a diagnostic medical imaging specialist, with 1 1/2 years to go. I've been studying full-time whilst working nights to support my wife and kids, but it's tough and we need every penny we can get. When I complete my training, we'll likely emigrate to New Zealand. We want the kids to grow up in a better place than where we are. If we're going to be able to do that, we need to start saving now. What does this have to do with the Chroma?? Well, after painstakingly restoring my Chroma, I'm considering selling it and the MIDIconverter, to help raise the cash to keep going through my University course and make it easier to start saving for a new life. Since it's my only instrument, I'd also then sell my sequencer, the SoundDiver editor/librarian, my MIDI patchbay, plus anything else that goes with it. Truth be told, I don't play it much at all. It spends most of its time in the flightcase, I'm so busy studying or working. The Chroma only comes out occasionally in holiday times. I've used it maybe 3 weeks in the last year and I really can't play - no practice time!! I keep telling myself that when I've qualified, and I'll have a lot more time, I'll get my time with the Chroma then. And the kids can enjoy learning an instrument too. But I could always buy them a cheap home keyboard instead and sell the valuable one. But it's not like selling a car, or my CD collection or any other things like that. I've owned my Chroma for 20 years now and I love it. I put a lot of care and time into restoring it. They're rare enough in any condition, let alone in perfect order like mine is. And if I do sell it, I know I'll probably never have another. Oh dear, what should I do...? See chroma on Ebay UK (May 2005) for further developments. I have, at long last, reached the point of having a working beta version of the new Chroma site. I'm grateful to David Clarke for reviewing earlier development versions, and now I'd like to open it up to a wider audience to work out remaining bugs before shutting down the old site and going live. Hats off to you. The new site is incredible!! Something to be very proud of!!! Is it ok to go public yet ? I would love to post it on some boards for you. Hats off to you. The new site is incredible!! Something to be very proud of!!! Thank you. It's been an enormous amount of work; but, as with everything involved with the site, I've learned a lot. I'm going to write at least a couple of papers on it: one from a human-computer interaction perspective (this is my area of expertise); and another about development issues (what I've done is I think quite innovative in completely separating content from presentation via XHTML, CSS, and PHP). Is it ok to go public yet ? I would love to post it on some boards for you. Not quite, but I'm very close. I want to add some PHP error checking. I will send an announcement to the list when it's ready to go public. See Reviews for the current URLs. A Chroma is up for sale on Ebay. - Not mine! This one's in Texas. 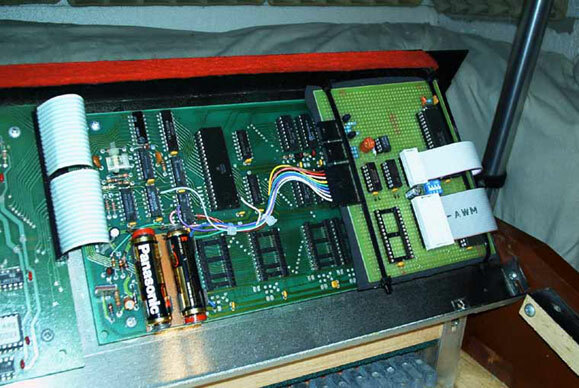 It seems to have MIDI sockets fitted at the back right of the synth, like the internal fitting instructions for Ken Ypparrilla's MIDI converter. Auction ends on 15 January. This instrument was for sale back in July 2004. [See Chroma on eBay, with picture]. This is Chroma 21030818, now owned by George Sarant. That canadian guy stripping and selling hos chroma might have. Anyone who has kept his address? I think you're talking about Russ Lyons, who auctioned off a couple of voice boards from his Chroma #21030574 in October and November (and who would not ship outside the U.S., which a few of us Canadians were grumbling about). Brian, it might be worth asking him about slider caps if MusicTek doesn't have any. eBay item 3762302449 among others should get you in touch with him; or e-mail me privately and I'll forward you his address. Ironically, I believe I bought one of his voice boards. I remember also emailing him after the fact about these slider caps but never heard back. I think I'll try again. It wouldn't hurt. hi, my name's Chris, Im having some problems with an old Chroma and this is the only place Ive found to ask about them. I pulled this one out of its case after it was in storage for many years, but when I turn it on it doesnt seem to work. Now im just going to describe what happens when I turn it on. hi, my name's Chris, Im having some problems with an old Chroma... ... As soon as I turn it on all the lights go on for a second, and then the ones stay on that were on last tiem it was turned off, and 01234567 is displayed in the DATA READOUT until I pick a Param or Program. Chris - when the Chroma first powers up, it attemps to automatically tune each of the 8 dual-channel voice boards. It lets you know if a board has failed by putting the board number in the display. In this case, it appears that all 8-boards failed the auto-tune (i.e., board #'s 0, 1, 2, 3, 4, 5, 6, 7). ... I found something that said pushing Edit A and B and then pressing all 50 of the buttons while holding Param Select clears it to a saw wave, that didnt work either, no sound comes out but the buzz when the speakers are turned up loud. This process should indeed be a fail-safe way to get a sound out of the Chroma - but once a board fails the auto-tune, the Chroma tries to 'help' you by muting those voices, and removing them from use (i.e., by default it won't let you hear a 'bad' voice). In your case, as all eight of the boards failed the tune - there are no boards left 'in service' to actually make sounds. 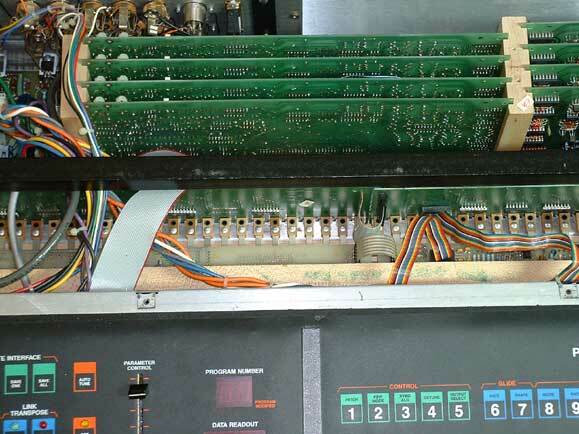 I would first recommend a visual inspection to confirm that any/all cables inside are connected (is it easy to accidentally knock off one of the ribbon cables when opening the front panel - for instance, when reinstalling installing the batteries). If everything is plugged in (and apparently plugged in the correct way), I would then suggest reseating the voice boards (and looking to confirm that none of the connector pins are bent). The 8 voice-boards are illustrated in the upper mid/right of [this picture from the Pressure Sensor & Interface article]. These cards can be removed by pulling upwards. If no positive behaviour is achieved by the reseating, then the next things to check would be things like the Power supply levels, etc. (as noted in the service manual). After the Chroma has powered up, attempt a 'warm reboot' by pressing the "Set Split" button, and then pressing the "50" button. This may let you know if the 'auto-tune' problem is only occuring on a power-up. You might also be able to at least 'hear' the Chroma by pressing 'Set Split' and then pressing "31". This will attempt to tune the voices - but even if the tuning fails, it will allow them to sound. the display information after power up (01234567) indicates that all the voice cards could not be tuned. The Chroma automatically turns off the voice cards out of tune. Since all voice cards are out of tune, no one will be activated and you will not hear any sound. There is a hidden function by pressing [SET SPLIT]  (mentioned in the service manual) that allows to reset the chroma and not switching off the bad voice cards. I would start with this procedure. If then there is a sound to hear, it is a simple act of tuning as described in the service manual. Otherwise I would start testing the power supply. It might have happened that the condensators dryed out and have to be replaced. Hope this gives you a start point. That was me with the leaking eproms [see Murray's registry entry for 21030715]. What you are seeing on the CEM chip with the two resistors is a thermal compensation design employed by the factory to keep it in tune as the synth heats up. The white stuff is some type of thermal heat sink transfer goo. It is supposed to be there. The "white goo" you described is actually supposed to be there. I believe it acts as a heat transfer. Reference the 01234567 on initial boot. One bad voice card can cause a readout like that. I would suggest taking out all 8 voice boards, and put them in one at a time and reboot each time. I think you should get one that will come okay. Then, start adding boards and use the process of elimination to find out which board is the problem. You might be able to get even better with the voice boards. Try cleaning the connections on the voice boards there may be some oxidation built up there, AND try different positions for different boards and re-seating them again. Cleaning the key contacts is pretty easy, as a recent tech wrote to me: "If you experience problems with keys not playing or sticking, first just try to hit and release the key a few times consecutively with a fair amount of force. If this does not work find the key contact (3 metal blades for each key), after cleaning the strips with Iso alcohol, this may work if not and the key is stuck in on, then the bottom blade needs bent upwards towards the middle blade. If the Key will not play then the top blade needs be net downwards towards the middle blade. Do not bend the middle blade. I most cases this will fix 98% of key contact problems." For further discussion on cleaning the key contacts, see Chroma Keyboard Repairs, January 2012. Good luck and congrats on awakening your sleeping giant. after 2 years of development, here is a little preview of a future article that will appear on the site..
Q: What is the CEB ? Q: What is the main purpose of the CEB ? 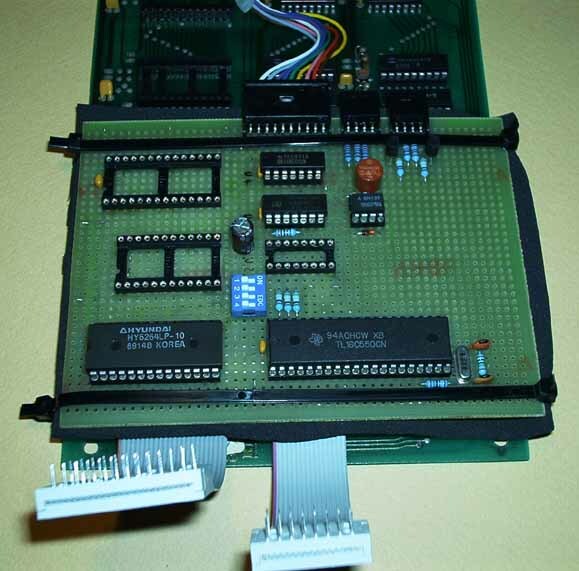 A: The original firmware fills all the available 16KB ROM, so it is impossible to add new features without more program memory; the CEB doubles the ROM space and at the same time adds more RAM; but probably the more interesting feature is the on-board MIDI. Q: How MIDI is implemented ? A: The new firmware implement a full KMX compatible MIDI interface with added features like Local on/off and the programmable Midi Controllers Map; on board MIDI mean lower latency compared to an external interface connected to the data port. See the MIDI interface section for details. Q: Where can I find the CEB and the new firmware ? A: I designed the CEB for no-profit purpose; I provide you schematics and all the details but you have to build it (or have it built by somebody); the components needed are cheap and very easy to find; David Clarke has designed a nice PCB (my own CEB is still in the form of a wired prototype, see pictures); see construction details. Components cost is well under 50 US$. The new firmware is free and can be downloaded from this site in the form of a binary file for EPROM programming. It is a work-in-progress so new releases will be available in the future; every version is tested by me and David before publishing. Q: Is the CEB simple to install ? A: Yes, for a skilled technician but it is not recommended for beginners; ask to a really competent friend. Sandro's article, Chroma Expansion Board and New Firmware, was added to the site in March 2005.
that sounds like a really good job! is there some more infor available? Do I read this right?? You are working on coding a new Chroma OS with hardware board that has additional memory space and built in MIDI ? Would this be similar to the Europa upgrade for the Jupiter 6 ? Interesting, although Im thinking most who want midi would be very happy with the syntech box (which I have). Keep us updated please. I am willing to beta test the hardware and software. Where can I buy the PCB? Should we get together and make a small run of them? If so I'm in. I understand that somebody may think that I'm joking....so I've enclosed a couple of pictures of the CEB installed on my Chroma. It's something really GREAT ! When you think to share your website url ? But tell us what it can do then! "Initial work on the Chroma was done at ARP Instruments, but ARP was well on its way to a fatal collision with an iceberg. Found floating in the chilly waters, the Chroma was picked up and brought to market by Rhodes, a CBS subsidiary. 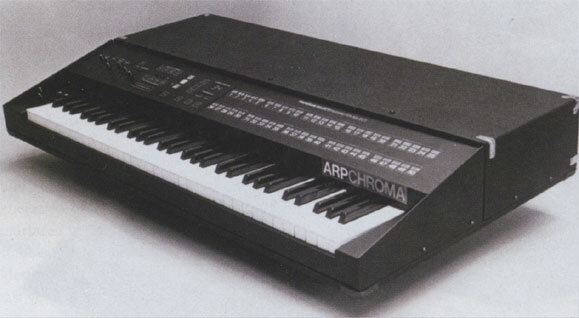 The Chroma was one of the first synths to do away with banks of knobs and sliders in favor of data entry, a cumbersome system since parameter names weren't displayed on the panel. The velocity-sensitive keyboard (with full 8 bit sensing, as opposed to MIDI's seven bits) and computer interfacing were also luxury features: Hooked to and Apple IIe, the Chroma had its own sequencer and patch librarian." It's been a while since you've seen any significant additions to the Chroma site. I apologize for that (particularly to contributors who have been waiting to see their materials online), but I've been working hard on a major revision, the third since it first came online in February of 1999. It's taken me a lot longer than I predicted almost a year ago now, but today I have finally re-launched the site at www.rhodeschroma.com. Not only does it have a new home, but it has been completely revamped. In terms of content, I have gone through every sentence, graphic, and link. Over the course of almost six years, when a site grows as this one has (from five to over 170 pages, comprising almost 1000 files), portions inevitably become crufty, dated, and error-prone. It also tends to grow in unexpected directions; so the new structure better anticipates future growth, based in part on new content I already have lined up, while the technical aspects outlined below provide means to reorganize with minimal effort. While all of this was a lot of work, it allowed me to see just how large and valuable a resource the site has become. The biggest effort in terms of content review was the five plus years of ChromaTalk mailing list archives. This is a gold mine of information that, on the old site, was not as well leveraged as it could have been. With this revamp, I have added more cross-linking as questions and problems were answered and resolved in subsequent months or years. The 2004 archives are now online at the new site; I hadn't been posting these on the old site as the duplicate effort would have slowed progress on the redesign. Other changes I've made to the list archives include the elimination of member e-mail addresses for privacy (I've also done this generally throughout the site, and entity-encoded addresses where it made sense to retain them, in order to reduce spam); their replacement by owner serial numbers, linking into the expanded and restructured instrument registry; and the addition of time zone-correct dates and times for posts. Each monthly archive is now organized by thread rather than strictly chronologically, which I think makes them easier to follow. I have also eliminated the by-digest division of the 1999-2000 archives, and gone to months throughout (there have been posts every month since the list started in June 1999, except for December of that year). From a technical point of view, the site has moved from badly outdated markup to the latest web standards: 100% strict XHTML 1.0 with CSS used for all presentation. Tables are used only for tabular data, there are no spacer gifs, only standard structural tags are used, etc. (See the Web Standards Project for more information.) The entire site is generated from a single base file, using PHP, thus completely separating content and presentation, and eliminating all redundant content and markup. Similarly, the navigation is generated from a single file per section, making maintenance easy (previously each page in the site had its own copy of all navigational content and markup, requiring custom changes to every file affected by an update or addition). Accessibility is vastly improved, and compatibility broadened (in terms of current and future browsers, and alternate devices). Both of these efforts (XHTML/CSS and PHP) required considerable effort, and took me back to the drawing board; but it was a great learning experience (I will write up some notes on my approach at a later date [see Site Implementation and Site Design]), and makes the site almost trivial to edit and maintain. CSS allows me to completely reconfigure the visual design and layout of the entire site without touching any of the content files at all (see www.csszengarden.com for a great example of this done on the fly). In other words, the site now has a solid foundation for years to come, and I don't anticipate having to do this depth of reworking for ages, if ever. In terms of the appearance of the site, a few things have changed. The basic Chroma panel navigation has been retained; the same one is now used throughout the site (in the old site, the ChromaTalk archives and service bulletins had used different panels). The left-side navigation adds support for multi-page article expand/collapse grouping, which you can see for instance in Dave's voice boards article and in the list archives (which are now grouped by calendar year rather than "volume"). This certainly made it easier for me to get around the site while I was developing it, and I hope this indicates an improvement for all. I think the visual design provides better feedback, with an adaptation of the Chroma panel button design for current page, hover feedback, multi-page articles, and "featured" pages. Finally, the appearance of content headings, paragraphs, and such have been standardized and modernized, and also sport a somewhat Chroma-derived theme. I may at some point investigate putting the content into a database, and implementing a search engine. But that will have to wait a while, as I'm going to focus most of my Chroma-related efforts on the long-simmering editor/librarian for Mac OS X. Of course, there will also be new content starting to appear again. Over the last few years I've received a number of interesting new articles and other information, and have enough to post something new and interesting regularly for quite some time to come. If you have something to contribute, please let me know and I'll be glad to put it in the queue. To begin with, I've transcribed and posted the Performance Manual. It seems to me that this has been a neglected piece of documentation: while the Programming Manual addresses more in-depth issues with the instrument, the Performance Manual answers a few of the issues that seem to have become FAQs. I have also added a Polaris section to the site, to collect some of the information often requested about the Chroma's little sibling. Finally, I want to send out a sincere thank you to everyone who's been involved with the site over the years, whether as a list member, contributor, or reader. It's been a great experience, I've learned a lot, and I've met a great bunch of people. As I've said before, when I started this "little" site I never expected the level of interest or readership it's attracted. The old site generated a total of well over 100,000 pages views (I stopped counting a few months back) [this was actually only in the first nine or ten months of 2004--see Statistics], and there are now more than 80 ChromaTalk subscribers. A special thanks to David Clarke [21030085++], who was always willing to provide detailed feedback during the time I was making slow progress with this work (not to mention his having acted as unofficial mailing list guardian and prime tech support contact). Thanks also to Don, Vincent, Murray, Paul, Edwin, Åke, and Jesper for beta testing the new site--it's improved significantly in the last couple of weeks. Sorry to have been so long-winded. Let me know what you think. Enjoy! I would like to pass on my thanks to Chris for his work on the site. Far too often you'll see sites rise up, be busy for a while - and then disappear (only to linger online for years, unkept, un-maintained - and generally un-useful). This has not been the case with the Chroma site. I have certainly enjoyed my time here and am personally grateful for all the hard (and unpaid) work done by Chris - not only in the initial setup of the site itself, but also in his continuing involvement and participation. Chris - thank you for the Chroma site. Specifically, thank you for all your hard work and interest, both in the new incarnation as well as all the work done over the past 6 years. Thank you for giving us all a place that we can come and get a little more enjoyment out of our keyboards. Yes, I would like to second this. I do not know any other web site that offers this big amount of really helpful information. I think based on Chris' work, a lot of Chromas can survive (as mine did). THANK YOU A LOT, Chris (So I take my hat off). Congratulations on the new site, it is superb. The Chroma site through the years has been invaluable to us Chroma owners. The truth is, had this site not been available, there would be alot of Chromas resting in their black cases, gathering sticky foam. Thanks to you, we have been able to find a forum where we can find answers to the perplexing problems of our marvelous finicky beasts. I know I speak for everyone when I say "Thank you Chris". i couldn't agree more. i wanted to help beta test but am too busy moving right now. sorry for that. i have a bad conscience... had this site not been in existence, i wouldnt own a chroma... thank you chris! As Chris and I have discussed the site could be even greater with user submitted wav. or mp3 Chroma sounds or music with Chroma in it to show off the greatness of the synth we all love. Olli and I will be putting some together this year , anyone else ?? Thank you, everyone, for your kind words--and your help with the new site. In its first week, almost 700 visitors have viewed about 7000 pages; Google has indexed much of it (and it is already on page 5 of the results for a search on 'rhodes chroma'); and most links to the old site have been updated. A minor correction to my original e-mail: I said the old site had generated over 100,000 page views. That was just during 2004, when almost 27,000 visitors viewed more than 118,000 pages at the site. I have the site stats up for anyone interested. Advantages to Chroma XLR out ?? Are there any advantages of using it ? Just the same you get with any XLR out; a bit higher resolution, and also longer cable runs. Whenever you're taking a signal from an instrument (eg your Chroma) to a mixer, amp, etc, you want the signal to arrive at its destination in the best possible state: no added noise, sufficiently strong, no distortion and good clarity. How succesful you are at achieving this depends very much on the type and quality of the cabling carrying the signal. XLRs are a more effective means of transporting the signal than jack leads. The jack outputs are of a type referred to as "unbalanced". Their cables have two conductors - a signal wire and an earth wire. The earth is wrapped around the signal core in a coaxial arrangement in the hope that it will screen out any airborne interference to the sound that you want the cable to transmit, in this case the Chroma's output. Airborne interference could be radio frequency signals, induced hum from other electrical equipment in the vicinity (amps, mixers, other synths, lighting, etc). It works well enough for most uses. However, in a live or studio situation there are many sources of interference and some of it can get through the screening to induce noise and degrade the Chroma's sound. In live situations, where the amplification is very powerful, induced noise is also powerfully amplified, potentially ruining your sound. Additionally, the signal strength degrades in long jack leads, which act as longer "aerials" for the interference to be picked up. So jacks are good for uses where interference is low, amps are not massively powerful and the leads are not very long. Fine for most uses. The XLR outs are of the "balanced" type. In the cables that connect them, there are three conductors - an earth screen, a signal+ and a signal-. Because any interference is equal and opposite in the two signal cores, the interference is cancelled out and you're left with a nice clear unpolluted Chroma sound, even over very long runs of cable. So XLRs are a pro-audio solution to getting the cleanest possible sound over long cable runs or in areas of heavy interference. XLRs also carry stronger signal voltages - The maximum signal strenth from the Chroma's mono jacks is +/- 10V, according to the Performance manual. The maximum from the XLRs is +/- 12.3V, or a +24dB increase over jacks. This enables the XLR signal to have a significantly lower noise floor than the jack and it should have a better dynamic range as a result. Most mixers have XLR inputs for microphones, as the very small signals from mics are easily susceptible to interference. You can get superb sound quality from your Chroma in these inputs but make sure that the input gain of the mixer channel(s) is low. or you're using the input "pad" switch, so the high signal strenth from the Chroma doesn't overload the input. And most importantly, DON'T have the mixer's XLR phantom power switched on! This delivers 48v through the XLR to power condenser mics - you don't want to risk sending 48v into your Chroma where it's not supposed to go! When I owned a pro studio, I had my Chroma wired into the desk via XLRs. It was worthwhile for the very best sound quality. Live, I found that XLRs do reject interference - my D-50 output leads used to pick up passing taxi radios, while the Chroma, on XLRs didn't! I use my chroma at home nowadays, the jack outputs plugged straight into my hi-fi amp are fine here. Bottom line: you should consider using XLRs for pro use, but if the sound you're getting from the jacks is good, there's no need to change.